As you get older and your ovaries get smaller, your fertility decreases. Small ovaries have reduced reproductive function because they have fewer follicles and eggs remaining. Women age 35 and older are particularly at risk for infertility as their ovaries get smaller. 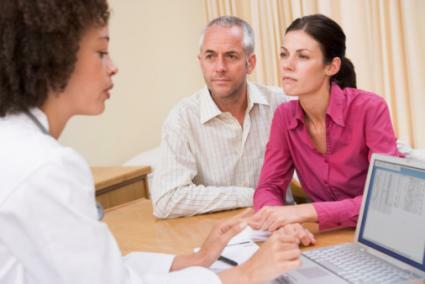 Infertility specialists consider ovarian size an important predictor of your ability to get pregnant. In a University of Edinburgh study published in 2012 in Obstetrics and Gynecology International (OGI), the authors note the size (volume) of the ovaries reflects the number and fertility potential of the follicles that remain (ovarian reserve). If your ovaries are small and contain few early follicles on ultrasound, and your pituitary follicle stimulating hormone (FSH) level on day three of your menstrual cycle is high, you may have difficulty getting pregnant. You will have more trouble conceiving if your ovaries are about two and a half centimeters or less in length. Post menopause: 2.2 cm³ (15 years after). The authors note fertility is significantly reduced when the volume of each ovary is 3 cm³ or less. Much of the observations on the effect of small ovaries on fertility comes from women undergoing in vitro fertilization (IVF) or other assisted reproductive technology (ART) procedures. The women who are able to continue the IVF cycle need more fertility drugs to stimulate the ovaries, and fewer eggs are retrieved than normal. If IVF fails to overcome your obstacle of small ovaries, you may have to consider other options, such as donor eggs from someone younger, or adoption. The natural, steady loss of follicles and volume of the ovaries accelerates at age 37 and is even greater beginning at age 40. There is an even greater decline in fertility after age 40 until menopause because of the accelerated loss of follicles at that age. Small ovaries have fewer follicles and eggs and reduce your ability to get pregnant. See your gynecologist or a fertility specialist for an evaluation if you are concerned about the size or function your ovaries. Don't delay if you are age 35 or older, or your menstrual cycles are becoming shorter or irregular.